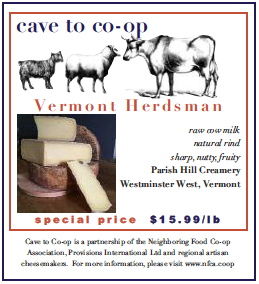 Parish Hill Creamery produces seasonal, hand made, raw milk cheeses inspired by the traditional cheeses of Italy. Peter Dixon brings over 30 years of cheesemaking experience and he is joined by his wife Rachel Schaal and sister Alex Schall. The creamery is the culmination of Peter’s years making cheese, teaching classes, solving problems, and imagining possibilities. Peter, Rachel and Alex love making cheese. They make cheese traditionally, simply, as near to home as possible, and with the highest quality ingredients and results as can be had. Parish Hill gets beautiful milk from Elm Lea Farm at the Putney School, just up the road from the creamery, and the milk is the result of healthy animals grazing lush pastures. Protein and fat are balanced ideally for the cheeses produced, and the cheese changes subtly throughout the season, reflecting the growth and maturation of various pasture plants. Their starter cultures are made from the milk of 4 individual cows. Helga, Abigail, Clothilda, and Sonia were chosen for their health, their components, and their disposition. As a result Parish Hill makes mother cultures that are truly an articulation of their milk and the resulting cheese is a revelation of that milk, the cows, the pastures, the water and the land. 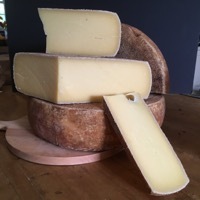 Whole milk, long-aged Asiago-style Herdsman is made when the cows are grazing on hillside pastures and aged at least 12 months to develop a full, slightly sharp flavor with hints of pineapple and hazelnuts. The supple interior becomes granular as the cheese ages beyond a year. The straw-colored edible rind is scrubbed weekly when young. Peel and slice the potatoes very thinly and place in a bowl. A mandolin works well for this! Melt the butter with the olive oil, and then stir in the rosemary, salt, pepper and grated Herdsman. 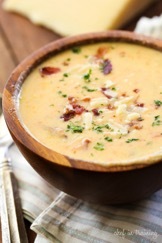 Pour this over the potatoes and gently toss until they are well coated. Lightly butter a 12 cup muffin pan. Divide and layer the potato slices evenly between the muffin tins, completely filling them to the top. Sprinkle additional cheese and rosemary over the tops, and then a final scatter of sea salt. Bake for 40-50 minutes until the potatoes are golden brown and crispy. Take them out of the oven and let them sit for five minutes to settle. 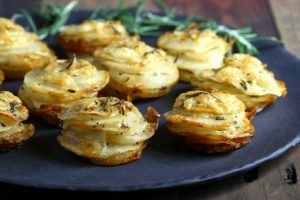 Remove the potato stacks from the tins and serve. Blend flour, baking powder, salt and cayenne in a small bowl. In a larger bowl mix pumpkin, cheese, melted butter, egg and sage. Fold the flour mixture into the pumpkin mixture gently until just mixed. 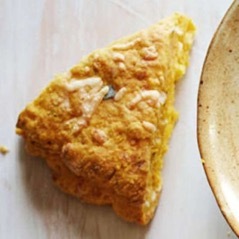 Turn the whole thing out onto a well-floured piece of parchment paper. Gently pat the mixture together, folding twice and ending up with a 7-8 inch circle. Do not over handle the dough! With a greased sharp knife, cut the dough into 8 wedges without separating the circle. Bake for 20-25 minutes, until dry to the touch and baked through. Separate one wedge – the edges should be done, not wet. If they are, bake the dough for an additional 5 minutes.